There are heel turns, and then there’s what World of Warcraft’s Sylvanas Windrunner—current leader of the game’s Horde faction—did in a new short released by Blizzard yesterday. She torched the World Tree, a major Alliance landmark, and slaughtered countless innocent night elves in the process. Now Horde players are revolting. Then, yesterday, the World Tree reveal happened. Now, Sylvanas has always been pretty warcrime-happy, with the blighting of Gilneas being her greatest hit. In that case, though, you could argue that she was Just Following Orders—not that it really excuses her actions or subsequent over-use of force. Still, many players contend that the World Tree incident is more blatantly nefarious. 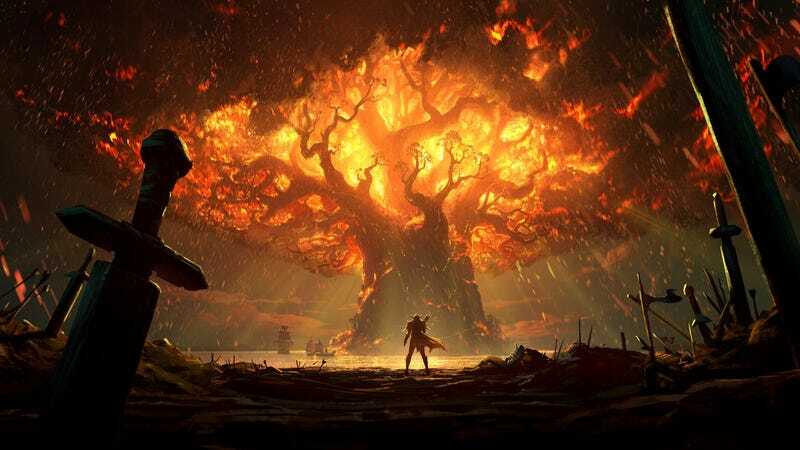 Originally, Sylvanas just wanted to invade (rather than destroy) the gargantuan tree to prevent the Alliance from gaining more of a powerful mineral called Azerite. But then she had a conversation with a wounded night elf warrior named Delaryn Summermoon, who caused Sylvanas to flash back to her time as a regular high elf, which concluded with her having her soul ripped out by a previous major series villain, Arthas, and ultimately joining the Horde. In response, Sylvanas changed her plans in a rage and callously lit everything on fire, giving WoW fans flashbacks to the time a previous Horde leader, Garrosh Hellscream, ruthlessly destroyed a major human city. Garrosh proceeded to become crueler and crueler until he went full villain and became a raid boss players had to defeat. Players are now worried that WoW is retreading old ground, and a similar, less-than-gray fate awaits Sylvanas. They’ve reacted with everything from jokes and fan art to anger of their own, and even harassment of writers (which other players have called for an end to).